Photos by David A. Beloff. 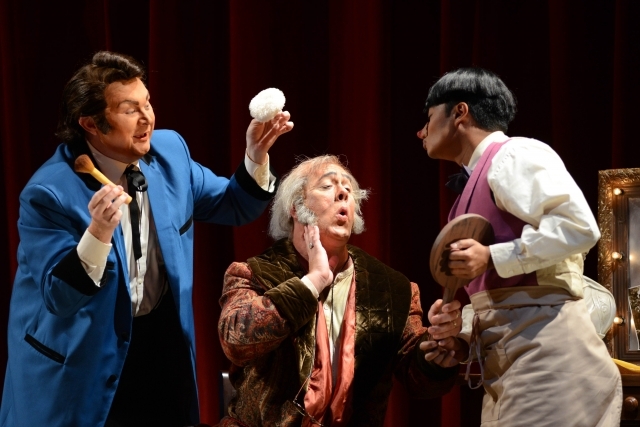 Left to Right: Jeffrey Tucker (Pistola), Stephen Powell (Falstaff), Jeffrey Halili (Bardolfo). The Virginia Opera chose to celebrate the 200th birthday of Verdi with a performance of his last opera, Falstaff, a less-performed, but delightful and brilliant setting drawing from Shakespeare's Merry Wives of Windsor and Henry IV. After having set two of Shakepeare's tragedies (MacBeth and Othello), Verdi excitedly worked with his librettist and close friend Arrigo Boito on Falstaff beginning in 1889, and at the age of 79 closely oversaw every detail of the rehearsal process which led into the February 1893 Milan premier. Verdi and Boito treat the subject of Falstaff, the fat, old, lecherous, and yet wonderfully comic knight, with a beautiful, almost seamless collection of wonderful ensembles, all built on fugues, and the kind of counterpoint one only learns from the tradition of J.S. Bach. 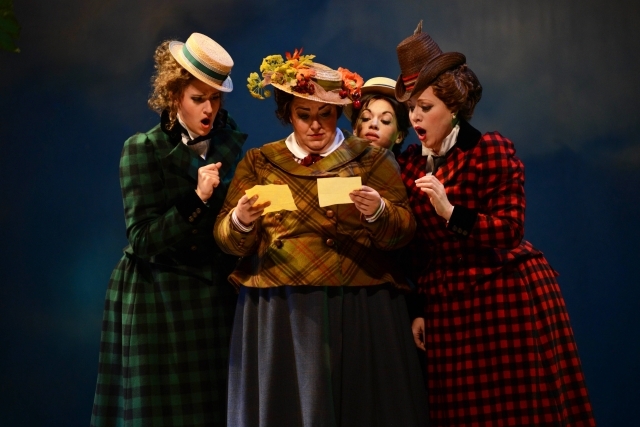 Left to Right: Coutney Miller (Meg Page), Ann McMahon Quintero (Mistress Quickly), Amanda Opuszynski (Nannetta), and Elizabeth Caballero (Alice Ford). 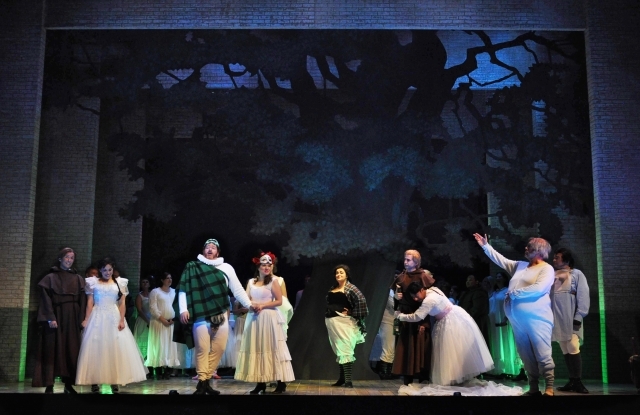 The Virginia Opera came through with a brilliant production of Falstaff. Baritone Stephen Powell was completely captivating as the title role, with a fine, rich sound that filled the hall with a full spectrum of colors—easily changing from chiding his servants about the uselessness of honor, to fantasizing about the beautiful Alice Ford, to boasting about his upcoming “conquests.” Verdi also utilizes the full spectrum of the woman's voice, with main roles for soprano, mezzo-soprano, and contralto. Soprano Elizabeth Caballero has a sweet, full voice, which played beautifully against the deep, rich contralto of Ann McMahon Quintero, and all four leading women are to be commended for their wonderful ensembles. The easy, warm sound of the young tenor, Aaron Blake (Fenton) was notable. There were a few distracting elements in the set design, such as the abundant nods to Shakespeare written on the set and props—while one or two are nice, so many sometimes served to distract from the action on stage—to the odd choice of the backstage of a theater for a setting, with big, sterile walls, rather than a tavern. However, the production held together very well overall, with amazingly tight scene changes, and reuse of props and scenery which maintained a coherence throughout the production (with a hilarious slow-motion “barricade” scene in Act II). The entire opera was punctuated by the wonderful fugal epilogue: “Tutto nel mondo é burla...ma ride ben chi ride la risata final,” (Everything in the world is a joke...but he who laughs last laughs best,) whose tight counterpoint was brilliantly executed by the entire cast. Overall, a wonderful production; a celebratory, happy nod to the composer on his 200th birthday.
. Raffaello Barbiera, Il solotto della contessa Maffei, (Milan, 1925).